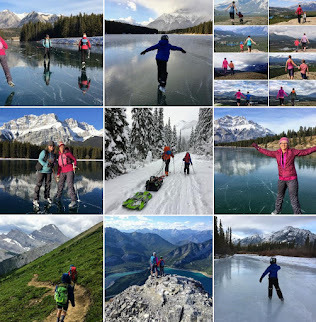 Family Adventures in the Canadian Rockies: Waiting Patiently For Spring - No More Snow! Last year we took up biking and paddling as a family. This year we plan to introduce our son to rock climbing and we want to start making the switch from his Strider balance bike to a real pedal bike. Taking up a new sport however can require months of prep work. With biking, we've been researching bikes and trying to figure out which one will give our son the best fighting chance to learn to ride (key word - light weight!). 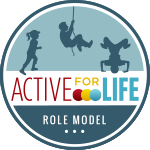 For rock climbing, we've enrolled Noah in indoor climbing classes at a local gym. A month of classes and we hope we'll be able to transition to outdoor crags once the rock warms up. We've also had to search out a harness that fits a 4 year old. We finally decided on the Black Diamond Wiz Kid harness from MEC. Spring is the perfect time to start getting excited about summer and make plans to get out and enjoy the new skills you are building now. I've started creating my trail list of paths we want to bike this summer as a family which will include the Millennium Trail from Banff to Canmore and the Troll Falls trail in Kananskis. I've also been working on a very long list of Rocky Mountain lakes I want to SUP this summer from Lake Louise in Banff to Maligne Lake in Jasper. Every time I get depressed about the snow, I just go back to my lists and start dreaming more about warm weather that will eventually arrive. Go through your footwear collection. Do your children's hiking boots still fit? Do they need new rubber boots? Need a new pair of sandals for summer? Go through the closets. Do the kids' hiking clothes still fit? Do they need a new rain jacket or rain pants? Now is the time to hit up spring clothing swaps so make your list. How many t-shirts do you need to buy? Pairs of shorts? New sunglasses from MEC for this season - aren't they sweet?! We've planted our sunflower and pumpkin seeds already and they sit in a sunny spot beside the kitchen table slowly growing into little baby plants. We planted them in recycled egg cartons so that when the snow melts, we can cut them apart and plant them straight into the garden. Want some more creative ways to start plants indoors or need ideas for gardening with kids? 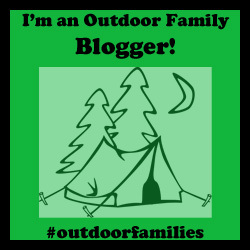 Check out my spring-themed Pinterest board for some great ideas from myself and other outdoor blogging experts. If you're lucky maybe you can just show up at a campground in your neck of the woods any day you want and find a great campground. That is definitely not the case here however. My calendar is full of booking reminders exactly 90 days before each planned camping trip this spring and summer. To date, I've already made reservations through the September long weekend because Parks Canada is now accepting reservations for the whole summer season. So what are you waiting for? Making some exciting plans just might help you forget about the snow temporarily. And while we are on the topic of planning, it's not too early to start thinking about next winter. I mean are you really going to feel like booking that wilderness hostel for the Family Day long weekend next February when it's hot and sunny in August? Might as well think about next winter while it's still easy to do so. I've already made three hostel bookings for next winter along with one hut booking with the Alpine Club of Canada. On the ball? Yes. But I also know that if I wait till next fall, I won't get a weekend spot anywhere that I want to go. Last April we took a trip to Fairmont Hotsprings in the warm Columbia Valley of BC. While Calgary was still blanketed in snow, I found green grass at Fairmont! Actual green grass. It was awesome! We went hiking on dirt trails (no snow), found running water, and spent hours in the warm hotspring pools there. Meanwhile, I know other friends that have had enough of this white business and are escaping to Arizona for a week. Wherever your budget allows, go somewhere warm - even if it's just across the border into BC for a couple of days. It might just help you hold on until the grass is green here too. If you aren't going to be off in the mountains hiking or skiing, you might as well be productive. Get the trailer ready to go so that you are ready to pounce on the first warm weekend in May. Tune up your bikes. Start building the sand box you promised your kids last year. Buy or build the new climber, tree house or swing set for the backyard. Need some inspiration for turning your backyard into an adventure-friendly playground? Check out my Outdoor Play Pinterest board for many cool ways to "playscape" your backyard. 7. Seize every nice moment! Bike rides on warm days are fabulous! The Calgary Zoo, Lake Louise, Banff, Kananaskis Village, Canmore... - all insanely busy come summer! But right now? Deserted, quiet and very peaceful. In fact, we are planning a trip to Banff this weekend to stay overnight. We look forward to seeing what this busy tourist town actually feels like for the locals when they have it to themselves. 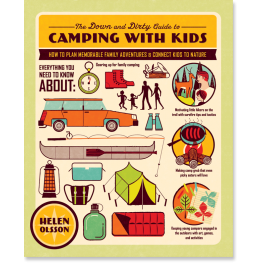 For a great list of camping and hiking themed picture books, check out the suggestions on my Christmas gift list I created last fall. I created an outdoor playgroup in 2012 and now we have groups of 10+ families coming on our camping trips this summer. We've been skiing and hiking together all winter, tobogganing and skating, and meeting regularly. We are ready to transition to hiking, backpacking trips, and many many group camping trips now. 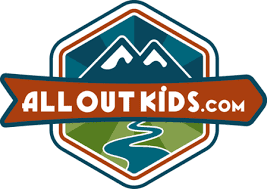 To start your own outdoor playgroup or family hiking group, please read the story I recently wrote for Calgary's Child called, Take it Outside - Planning the Perfect Playgroup. To join a playgroup in Calgary, visit Calgary Outdoor Playgroups on Facebook for more information. Not sick of the snow yet? Cool. Then check out the story I just had published in Snowshoe Magazine on spring camping at the Hilda Creek Hostel on the Icefields Parkway. Lots of good snow for sledding, snowshoeing and building snowmen there for at least another month. Yes, I liked your story on growing seeds inside. So far we are just doing sunflowers and pumpkins inside. Definitely can't plan anything outside yet. We do have raspberries though that should be bigger this year. We've tried planting lots of different vegetables but nothing really grows well here. :( Growing season is too short. And very bad soil! We had to bring in all new soil for our tiny garden.